Rebecca has a fun tutorial on her blog that will show you how to turn a few bobby pins into a super cute Rudolph bun for Christmas. A fun little hairdo for a class Christmas party or even Christmas morning. 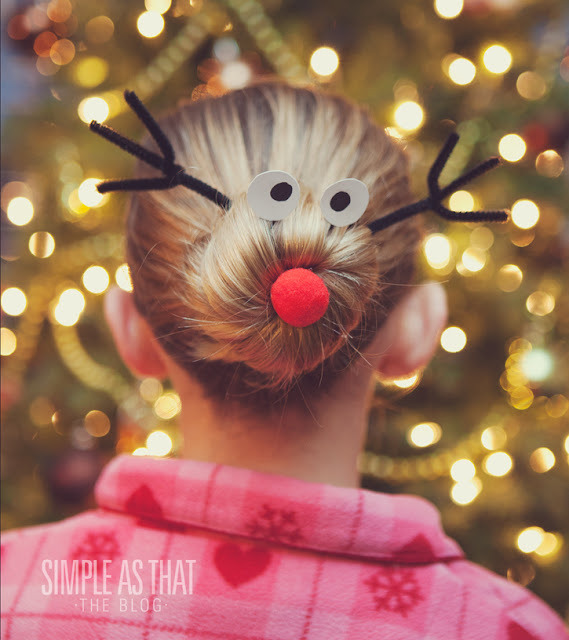 You can check out how to make a reindeer hair bun over at Simple As That. I have to say this has to be the most adorable hair bun I have ever saw. I think anyone (maybe for a funky office Christmas party, etc.) could pull it off. I am definitely going to pin this! I am probably repeating myself here. But this is super cute and just for little girls! I think teens and adults could wear it to stay in the spirit of the holiday for a party. That is so funny. My little girl just saw it and said "I want that face on my hair!" This so adorable!!! I need to show this to my friend, she'd love it too.